Pennsylvania ranks fifth among the top five states that have the highest employment level. A survey conducted by the Bureau of Labor Statistics reveals that the state employed 74,520 certified nursing assistants in May 2013 and the employment per 1,000 jobs was 13.27. In the same year, the mean annual and hourly income was $27,850 and $13.39. The average CNA salary in Pennsylvania was recorded to be $24,000 (as per the reports of indeed.com, as of January 2015). It was 4 percent lower as compared to the average salary of CNAs all over the country. So, if you are planning to work as a nursing aide in PA, then you can anticipate excellent job opportunities in the state. 90% of certified nurse assistants were paid less than $36,540; 10% were paid more than $36,540. 75% of CNAs earned less than $31,090; remaining 25% earned more than $31,090. 50% of the employees received less than $27,330; rest 50% earned more than $27,330. 25% of CNAs were waged less than $23,650; 75% were waged more than $23,650. 10% of employees made less than $20,810; 90% were offered more than $20,810. The geographic location does play a major role in deciding the salary of a certified nursing assistant in PA. There are some cities that provide handsome salary packages while some other paid peanuts. For instance, Levittown and Doylestown paid the highest wages of $36,240 whereas Scranton and Wilkes Barre offered the lowest income of $28,430. There are a number of specialization courses that not only help nurses attain higher positions, but also give them a chance to earn lucrative salary. In January 2015, according to indeed.com, the highest paid professionals were CNA Hospice who earned $31,000; following them were CNA Rrmc and Medical Assistant Family Practice, who made $28,000. CNA Medical Surgical made $26,000. The lowest paid ($14,000) workers were Correctional Prison Facility CNA. In the U.S economy, 3 of every 10 jobs come under healthcare category. This field provides a promising and recession-proof career. The Bureau of Labor Statistics anticipates that the employment for certified nursing assistants will expand by 21% in the upcoming years which is comparatively greater than other occupations. However, you can take advanced courses to enhance the scope of your career. Besides, the jobs for CNAs may be a bit difficult in nursing homes since many of them rely on the government funding. Question 1 – I’ll be completing my certification next month, what hourly salary can I expect in the state? Answer – The hourly salary of a certified nursing assistant in PA varies from $14 to $17. Doylestown and Levittown provide the highest hourly pay. Question 2 – Suggest me some top paying job titles in Pennsylvania. 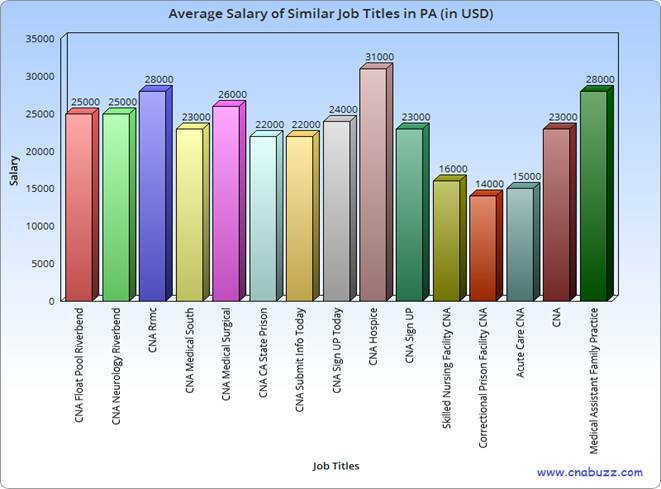 Answer – In Pennsylvania, CNA Hospice is the highest paid professionals with annual salary of $31,000. Other top paid job titles include CNA Rrmc ($28,000), Medical Assistant Family Practice ($28,000), and CNA Medical Surgical ($26,000).